TrekCore have released a backcover image from La La Lands' forthcoming Star Trek: Deep Space Nine Soundtrack Collection, revealing new details about the new release, which is only about a week away. 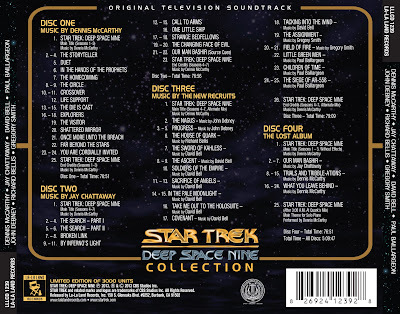 Amongst the details on the track listing are the identities of the episodes being highlighted on the "Lost Album" disc, which features Our Man Bashir, Trials and Tribble-ations, and What You Leave Behind. There are also enough variants of the opening and closing title music to have different versions on each of the four discs! The small print also notes that the album will be limited to 3000 copies.